Involve the women we serve and their families in their service planning. Women seeking services, their referring agencies and their families look for organizations that are accredited as a sign of quality when looking for services. 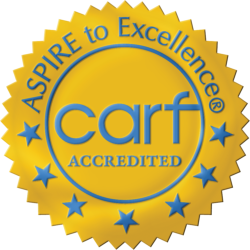 Accreditation is evidence to the women we serve that LTC has demonstrated its commitment to encouraging feedback, continuously improving services, enhancing performance, and managing risk. The women we serve and their families can be confident that services will be focused on their unique needs.